F/O David Perry Donahoo, Jr.
David P. Donahoo, Jr. was born 06/24/1921. He attended Woodlawn High School (Class of 1939) in Birmingham, AL . After graduation he married Johnnie McDoneld. They moved to Escambia County, Florida. 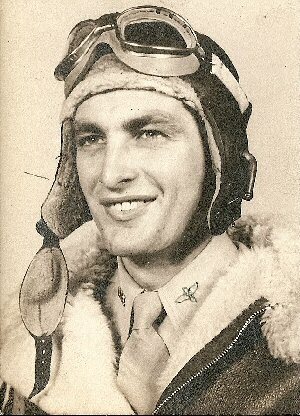 He enlisted in the Army Air Corps on 11 Dec 1942 at Ft McRea/Ft Barrancas - Pensacola, Florida. He atended radar school at Boca Raton, FL. and upon completion was assigned Smokey Hill Army Air Base in Salina, KS. According to the Missing Air Crew Report for Crew 26 shows Mrs. Johnnie Donahoo (wife) listed with a Birmingham, AL. postal address. Post WWII - Rowland Ball (Nav, P-3) who had known David and Johnnie Donahoo since their days at Doca Raton, FL shares that when he was back at Texas A&M, Johnnie Donahoo came to visit Rowland and his wife at College Station, TX. At which time, Rowland gave her a picture he had taken of David and his crew and explained what happened.